New information: The German authorities informed the Secretariat that the fifth state of conservation report, requested by the Committee at its twenty-second session will be submitted by 15 October 1999. The contents of this report as well as the views of ICOMOS will be submitted during the session of the Bureau. 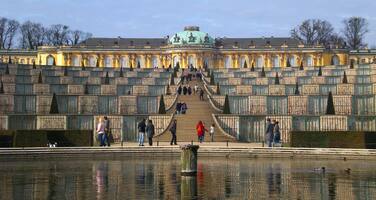 The Committee approved this extension to the World Heritage site of the Palaces and Parks of Potsdam and Berlin, on the World Heritage List under the existing criteria (i), (ii) and (iv). "The Committee commended the German authorities for their fifth report on the state of conservation of the Parks and Palaces of Potsdam and Berlin. It acknowledged the efforts made to restrict as much as possible the negative effects of the Havel project (German Unity Project 17) on the integrity of the World Heritage site. Nevertheless, it considered that considerable threats persist to the landscape and certain historic monuments, such as the Sacrow Church and the Babelsberg Engine House. The Committee wished to know whether it would be possible to restrict passage through the World Heritage site to standard-sized vessels and to develop the Havel Canal, which lies outside the site (the northern route) so as to permit the passage of larger vessels. It requested the German authorities to continue its efforts to find a solution in conformity with the requirements of the World Heritage Convention. A report should be provided before 15 April 2000 in order that it may be examined by the Bureau at its twenty-fourth session." The Bureau may wish to examine the fifth state of conservation report as well as ICOMOS’ views that will be presented at the time of its session and take the appropriate decision thereupon.